Each child goes through different psychosocial stages of development, which are accompanied by a series of challenges they have to deal with. These are the so-called age crises. Of course, they do not end with the transition from childhood to maturity, but they continue throughout a person's life following the course of his personal development. 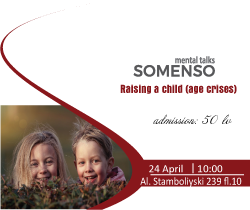 This training is for parents, specialists or students who want to understand a bit more about the emotions and behavior of children. You will be able to connect with your children's experiences through your own past experiences. The training includes learning about age crises, possible outcomes, case studies, and working in small groups. Mental Talks is a form of managed group discussion with size from 8 to 11 people, sharing their vision on the topic and guided by an experienced psychologist. The aim is every participant to take maximum useful knowledge that is applicable in her/his everyday life. WARNING: The group is held with a minimum of 6 people booked!